I'm such a sucker for a good pair of jeans and love all different styles. Boyfriends, flares, destroyed, high waisted, you name it. But there's just something about a pair of classic skinny jeans that pair so well with anything and everything. This pair, by 7 FAM, is beyond perfect. A little stretch, a slight mid-rise, and the ideal dark shade all make for a stylish, yet comfortable jean that's sure to be a closet staple. Love this classic look! Those jeans looks great on you! Loving the textured top and those heels! I love this necklace and your jeans are amazing! Those jeans look flawless on you! I love how that outfit would be perfect for a shopping day or a casual date night! Nothing is better then a great pair of jeans! Love this outfit!! It's so simple to throw together and go! Loving those skinnies for fall..
What a necklace. So pretty. Although it's clearly new with a high gloss finish, the style inspiration is vintage. Great piece. 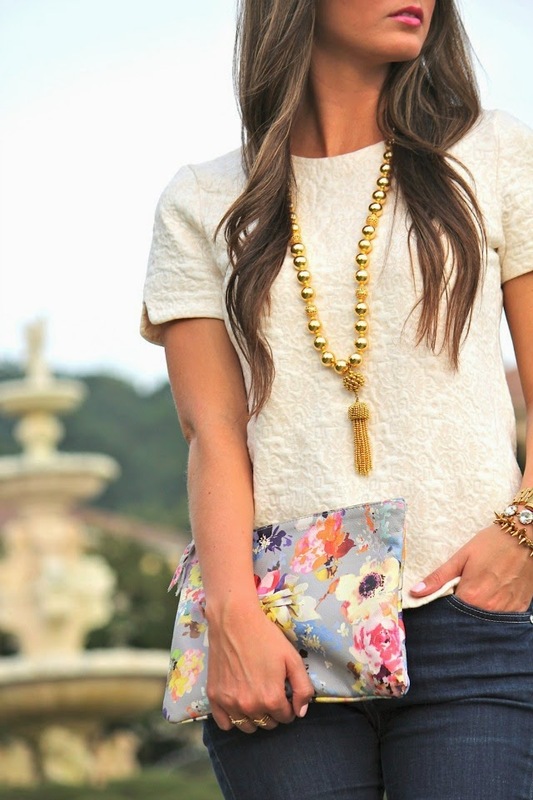 love that clutch! wish it were still around.